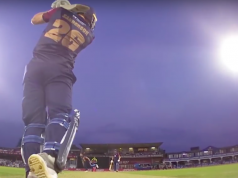 Northamptonshire booked their place at T20 Blast Finals Day for the third time in four years, as they eased passed Middlesex in the second quarter final at Wantage Road tonight. Adam Rossington hit an unbeaten 67, after a fine bowling display from the Steelbacks attack restricted Middlesex to 132-7. Rory Kleinveldt took three wickets, while Richard Gleeson and Seekkuge Prasanna both claimed two, the trio all going for a run a ball or less as Northants never allowed the visitors innings to gain momentum, despite George Bailey’s 46. Northants lost Richard Levi and Josh Cobb in the powerplay, but Rossington kept a calm head, first in partnership with Ben Duckett and then Alex Wakely, as Northants cruised to their target, winning with 11 balls to spare to book a place at Edgbaston a week on Saturday. It will be a third Finals Day appearance in the pervious four years for Alex Wakely’s men, who will look to go one better than their runners up medals from 12 months ago and repeat the title triumph of 2013. Rossington was delighted to see his side home: “It’s brilliant, it’s really important for the club and all the lads,” he said. 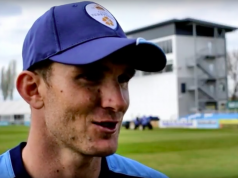 “I can’t wait for Finals Day to come around and hopefully go one better this year. “It’s really satisfying; the most important thing is to get over the line but it’s always nice to be there at the end having seen your team home. “We took early wickets, which always helps, and then carried on taking wickets throughout the innings. We managed to slow the rate right down and then chasing we lost a couple of early wickets, but we managed to build a partnership and win the game comfortably in the end. They had lost four of their last five group games, but produced a complete performance in front of a packed Wantage Road, controlling the contest from the moment Rory Kleinveldt removed Dawid Malan with the third delivery of the match. From then on they never allowed the visitors to get away, Bailey’s 46 coming at a run a ball, before Rossington ensured there was no wobbles chasing the small target, with a composed half century off 45 balls, but one that included four sixes. Whilst Rossington’s second half century sealed victory, it was the bowlers who set it up, Gleeson following Kleinveldt’s strike with one in the second over, Nick Gubbins bowled, both batsman having played onto their stumps. From 10-2 Bailey and Paul Stirling lead a recovery of sorts, but the spin of Graeme White and Prasanna kept the scoring rate down, the pair adding 68 at a run a ball before Stirling, who had hit two sixes, tried for a third off Prasanna only to find White at deep midwicket. From that point on regular wickets fell, Jon Simpson hitting Prasanna to long-on, before the big wicket of Bailey, who had been dropped by Duckett in the previous over, hit Gleeson’s comeback delivery straight to cover. Toby Roland-Jones and Ryan Higgins both skied catches off Kleinveldt, whilst there was only a single boundary in the last four overs as Northants completed a fine 20 overs with the ball. A total of 132 looked a straight forward task. There was a slight wobble though as, after smashing Harry Podmore for six, Richard Levi top edged a pull off Roland-Jones to short fine leg to fall for nine. Rossington also hit Podmore over the ropes, a glorious drive over long-off but when Josh Cobb sliced Higgins high to point, Northants ended the powerplay 41-2, the same as Middlesex at that stage. However, Duckett joined Rossington to ease any nerves in what proved to be the decisive partnership, though it could have been a different story had Duckett not been dropped early, Gubbins failing to hold only a low catch at cover. Duckett was on three at the time, but was soon into his stride, passing 2,000 runs for the season in all competitions before hitting Nathan Sowter’s leg spin for consecutive boundaries. The pair played sensibly, content to keep the scoreboard ticking over, with less than seven an over required for the target, and the odd burst of aggression, Rossington hitting Higgins into the sightscreen. Duckett showed his invention with a scoop but would then fall, pulling Higgins to deep midwicket. The stand of 58, however, had ensured that only 35 more were required from 36 balls. Joined by skipper Alex Wakely, Rossington ensured they wouldn’t need all 36 as he reached a half century in style, pulling Podmore for six, repeating the shot two balls later, the second flying out of the ground. Fittingly, it was he who finished the job with the winning boundary.